Heat Instant Pot on sauté and heat olive oil. Season turkey breast with sage rub, brown sugar and garlic and brown for 1-2 minutes. Add onions, carrots and celery and cook for two minutes. Deglaze with Holland House® Sherry Cooking Wine. Add cider and ½ orange and bay leaf. Turn off sauté setting and close lid and close vent. Turn on pressure cooking setting and cook for 30 minutes, until turkey breast is 165 degrees F.
Naturally vent for 10 minutes and then release pressure. Remove turkey breast from Instant Pot and turn on sauté setting. Combine cornstarch and water and add to cooking liquid in the bottom of the Instant Pot. Bring to a boil to thicken sauce. Slice turkey breast and finish with sauce. Garnish with scallions. Heat crockpot on high and heat olive oil. 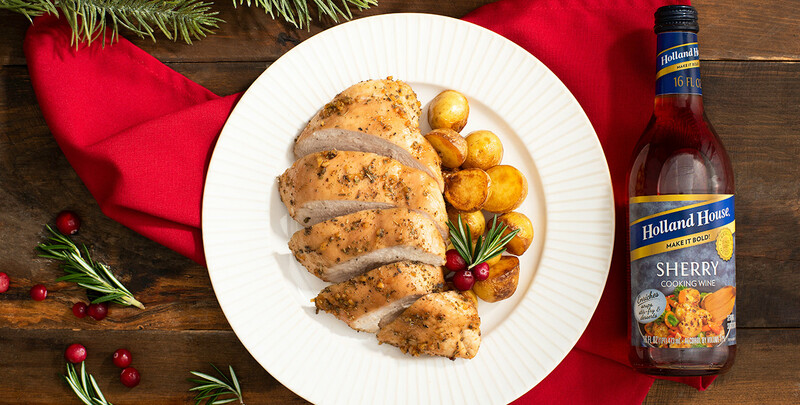 Season turkey breast with sage rub, brown sugar and garlic and add to Crockpot. Add onions, carrots, celery and Holland House® Sherry Cooking Wine. Add cider and ½ orange and bay leaf. Cook for 2 hours or until turkey breast is 165 degrees F.
Remove turkey breast from Crockpot and transfer cooking liquid to small sauce pan. Combine cornstarch and water and add to cooking liquid. Bring to a boil to thicken sauce.